Moses 1 Audio of the Sermon, 1st Half. Moses 2Audio of the Sermon, 2nd Half. I hope you have taken the time to read the short “biography” of Moses that we put into the bulletin. If so you know that his appeal is two-fold. On the other hand, Moses is “The Lawgiver.” It was Moses who gave Israel the Ten Commandments. It was the late Martin Buber who observed that Moses gave Israel just the right number of commandments to be remembered using the ten fingers of our two hands. 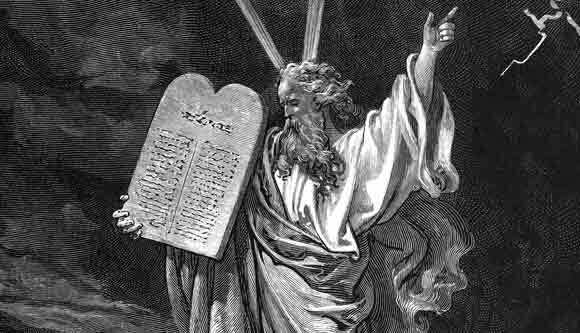 Of course, Moses did not stop with the Ten Commandments. The Law of Moses—the Law of God—the Torah, includes c. 613 commandments. They run from the humdrum, to the sublime, to the downright shocking. The most sublime commandment is found in Leviticus 19:18. There we read, “You shall love your neighbor as yourself; I am the Lord.” When, in Romans 13:9, St. Paul says, “The commandments…are summed up in a single sentence, ‘You shall love your neighbor as yourself,’” he is quoting Moses. One of the most shocking commandments is found in Deuteronomy 21:18-21. (ii) There we read that if a man has a stubborn and rebellious son, who will not obey his father, or his mother, even though they chastise him, then they will take him to the elders of the city and say to them, “This our son is stubborn and rebellious, he will not obey our voice; he is a glutton and a drunkard.” And then the men of the city shall stone him to death stones. Now I doubt that any of you have ever considered bringing a stubborn and rebellious child before the elders to be stoned to death; but it is not impossible. A man who ran for the state legislature in Arkansas in the last election proposed that we ought to enforce this Law, and others like it. He calls himself a Christian. When I read that, I found myself wondering if that man is a Christian or a father. A Christian would know the story of Jesus and the woman taken in Adultery—we will take that up in just a minute. A father would know that children often pass through times of rebellion before becoming the people that parents know they can be. I remember a time when my son was so head strong that we had a hard time living under the same roof. He would say the same. Now, I regard him as one of my best friends, and I confessed to him not long ago that he has become a far better father than I ever have been. I am willing to bet the law that permits the stoning of rebellious children took some of you by surprise. I wonder how many of you have read all 613 laws set down by Moses? If we read through the Law of Moses we invariably make two significant observations, and then, having made those observations, we ask two very important questions. First, we observe that a great many of the 613 commandments still make perfect sense, and we still live by them today. Most of you are perfectly happy to keep the Ten Commandments, and you are not ashamed to display them in your homes. Using your ten fingers, some of you can name them from memory. Even if you can’t you keep them, for you have a highly developed conscience, and you know them intuitively. Second, we observe that a great many of the 613 commandments no longer make sense for us, and wittingly or unwittingly we ignore them. All of us who are here this morning have already violated the Law of Moses in a number of important ways even before entering this sanctuary. I will name three. First, unless you were in church yesterday, you already missed the Sabbath. This is Sunday, the first day of the week, not the last. Second, some of us had sausage or bacon for breakfast, which is in direct violation of the law against eating the flesh of an animal with a cloven hoof. Likewise, the vast majority of us are wearing a blended fabric, and that, too, is in direct violation of the law. In James 2:10 we read, “For whoever keeps the whole law but fails in one point has become guilty of all of it.” Yet few of you are troubled by what you ate for breakfast or by what you are wearing, or by any of the other laws of Moses that you break on a regular basis. The very fact of our personal indifference gives rise to two questions. What did it matter if the people of Israel ate pork, or wore blended fabrics, or violated any one of the hundreds of little details in the Law? I think it mattered for two reasons. We are and we aren’t. We are certainly ruled by the Ten Commandments, and by the Moral Laws. Though it has not always universally recognized, God always intended that the moral law be universal. We neglect it to our own peril. It is not so much that we break the moral law of God as we break ourselves upon the moral law of God. We are bound by the moral law, however, we are no longer bound by what the New Testament calls “the law of commandments and ordinances.” The law of commandments and ordinances was specific to the Jews. It was the Law of commandments and ordinances that made the Jews a people apart, and made them distinctive, and helped to cement their sense of identity. In Ephesians 2 the apostle says that the time for that kind of distinction has come to an end. He writes that the Jew was one man, and the Gentile was another man, but that Christ “…has abolished in his flesh the law of commandments and ordinances that he might create one new man in the place of the two, making peace and reconciling us both to God on the cross.” (iv) Today, our relationship with God is not marked by our obedience to the details of the Jewish Law, but by our relationship with Christ. First, Jesus saw through the law to the Spirit and reason behind the law. Second, Jesus set some laws completely aside. Take the laws of clean and unclean foods. In Mark 7:14-23 (v) we read how Jesus called the people to him and told them that it was not what goes into a man that defiles him, for what he puts into his mouth enters not his heart but his stomach, and so passes on. He said that it is what comes out of a man that defiles him, for it is the from the heart (vi) that evil thoughts arise, including fornication, theft, murder, adultery, slander, pride, and foolishness. It is these things that defile a man. The text declares, “Thus (Jesus) declared all foods clean.” If you have barbecue for lunch, or if you go down to the beach this summer, and order Fried Shrimp, or eat a Po’ Boy Sandwich made with fried oysters, and lettuce, and tomatoes, on a hamburger bun slathered with Duke’s Mayo—I am hungry, you can thank Jesus for that freedom. Third, Jesus changed other laws laid down by Moses by the very fact of his life, death, and resurrection. Does the fact that Jesus changed so much of the Law mean that our faith is somehow radically different from the faith of the ancient Jews? Yes, No and Yes. Yes, we are different for we are not bound by the laws of commandments in ordinances that Christ abolished by his body on the cross: We wear blended fabric; we eat pork. No, for in some ways, especially touching morality, we are very much the same. Finally, yes we are very different in our total approach to the Law. iii By the way, in his book, “This Is My God,” Herman Wouk says that one of the chief reasons he believes in God is the miracle of Jewish survival. He says that the very existence of the Jews shows the hand of God at work in the world. iv 14 For he is our peace, who has made us both one, and has broken down the dividing wall of hostility, 15 by abolishing in his flesh the law of commandments and ordinances, that he might create in himself one new man in place of the two, so making peace, 16 and might reconcile us both to God in one body through the cross, thereby bringing the hostility to an end. vi In the Bible the heart is thought to be the center of the mind, emotions, and will.